Ever since seeing this design by Flying Mouse up for voting at Threadless, I have been patiently waiting for the day that it would finally be printed. Well, it hasn’t been printed at Threadless, but Flying Mouse has printed this amazing design for his own shop! This week’s new lineup at Flying Mouse 365 includes “Lunar Escape” among other sweet offerings, and it’s available both as a tee and as a hoodie. 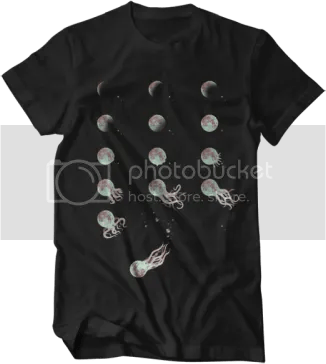 This design shows the moon going through its phases and then turning into an octopus-like creature that swims off. It’s brilliant! You can pick up “Lunar Escape” at Flying Mouse 365 for $15. Hurry though, because you only have about three days left to purchase it before it’s gone! Flying Mouse 365 Store Launch! If you’ve browsed through the Threadless catalog over the past two years or so, you probably have heard of Flying Mouse. This amazing artist won the Bestees award for “Most Printed in 2007” and began his Flying Mouse 365 project early this year. For this project, he designed and submitted one design to Threadless each day. To be honest, I didn’t know if the quality of the designs could have stayed up to par, but I was pleasantly surprised! Just today, Flying Mouse launched his very own FM365 shop, and seven new designs will be up for sale each week for 365 days. That means that you can get a whole calendar year of Flying Mouse goodness in your wardrobe if you want to! My favorite release this week is titled “Piggy Bank,” and it features little tiny piggies breaking loose from a broken piggy bank. I think I’d enjoy seeing that happen more than nickels and dimes spilling out! Tees at Flying Mouse 365 are priced at $18 and hoodies are $32. Head on over www.flyingmouse365.com to check out the neat new designs today!